Suntrader » SOLAR PV ELECTRICITY » How does it work? A Photovoltaic System is a generator that exports energy to the electrical power distribution grid. Photovoltaic panels transform the solar radiation into electrical energy in the form of direct (Dc) current (through a photovoltaic field, also known as PV generator); In order to utilise this energy and feed it back to the distribution grid, this energy shall be turned into alternating (Ac) current. The inverter does this conversion, also known as Dc to Ac inversion. 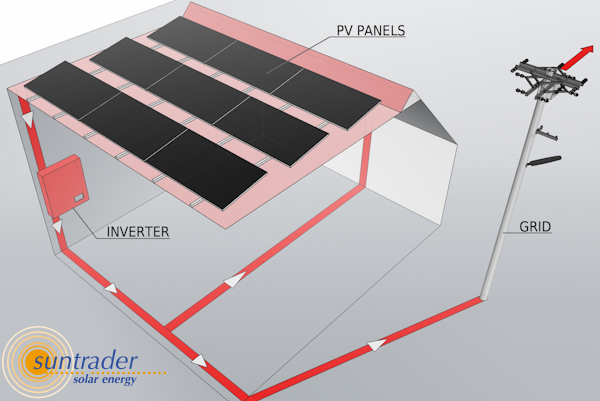 When used in parallel with the grid, the alternate current generated by the inverter is directly fed to the domestic distribution circuit, which in turn is also connected to the public power distribution grid. The solar energy system can thus feed power to all the connected devices, such as lighting devices, household appliances, etc. If the energy generated by the photovoltaic system is not enough, the energy necessary to ensure the standard operation of the connected devices is drawn from the public power distribution grid. If the energy produced exceeds that used, the difference is directly fed to the grid, thus becoming available to other users. According to national and local standards and regulations the produced energy can be sold to the grid or credited to the user for future consumption.